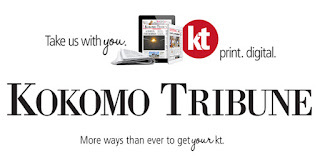 As part of my responsibilities as Night Editor, and later City Editor, of the Kokomo Tribune, I was one of the administrators of the newspaper's social media accounts and webpage, www.kokomotribune.com. During my tenure, we twice won awards specifically for our homepage. On April 7, 2015, I, along with the rest of the Kokomo Tribune staff, was awarded First Place for Website of the Year in the Community Newspaper Holdings, Inc. Best of CNHI Editorial Contest for Division 1. MONTGOMERY, Ala. - Aggressive coverage of breaking news and pursuit of stories that reveal hidden community dangers distinguished newspapers and websites in the Best of CNHI 2014 editorial contest. The Eagle-Tribune, of North Andover, Mass., was named Newspaper of the Year among CNHI's large dailies for its detailed news and photo coverage of the summer-long drama of a popular supermarket chain's near demise because of a family ownership feud, and subsequent rescue after a worker walkout and customer boycott that attracted national attention. The paper also was cited for its insightful reporting of separate tragedies involving a 13-year-old girl killed while crossing railroad tracks and a house fire that caused the death of two young brothers. Judges selected the Ottumwa, Iowa, Courier as Newspaper of the Year among smaller dailies for showcasing important community stories, including the death of a local Marine in Afghanistan, which warranted a four-page, pullout section. The paper’s extensive local news coverage also received praise. The Andover, Mass., Townsman earned Newspaper of the Year honors for the second year in a row among weekly and non-daily newspapers for its news enterprise and for its variety of feature stories and photos that celebrated the lives of local residents. Judges were also impressed with the paper’s dynamic opinion page that showed strong ties with its community. 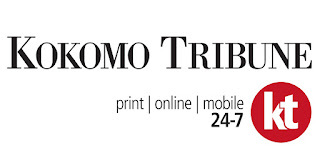 Website of the Year awards went to two Indiana newspapers: The Kokomo Tribune and the Logansport Pharos-Tribune. 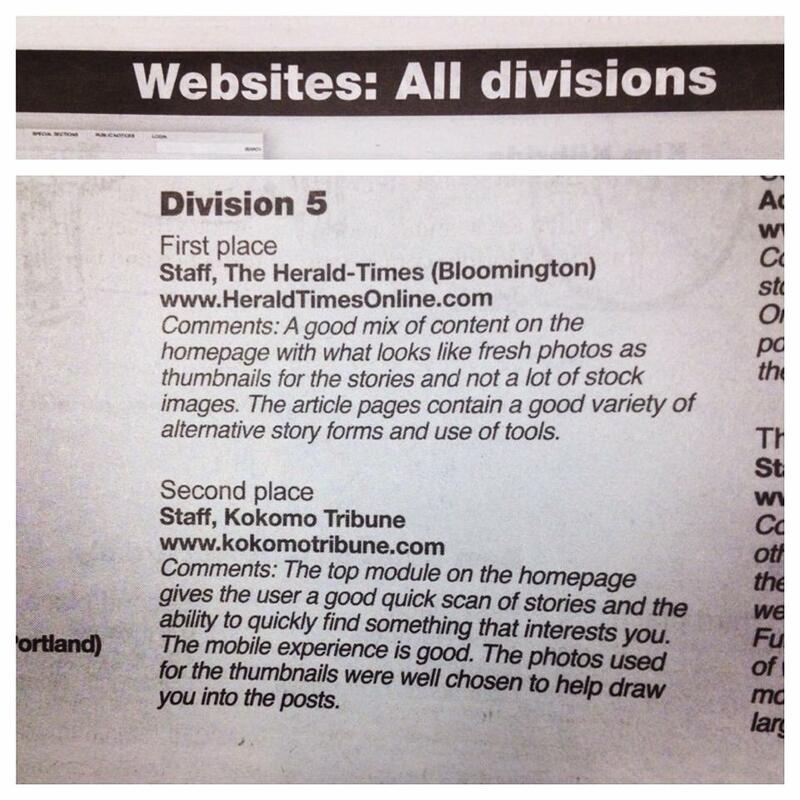 KokomoTribune.com and PharosTribune.com were cited for adept use of digital storytelling tools, notably on deadline. Judges also commended the Logansport website for its expert use of live-blog and multimedia to cover a devastating fire at a bed and breakfast, and credited the Kokomo Tribune site for engaging online readers in local elections. Two of CNHI's larger dailies shared the coveted Public Service award for casting light on hidden problems and rallying readers to action. Judges commended the Enid, Okla., News & Eagle for a comprehensive report that used data analysis and interactive maps to portray a scarcity of working fire hydrants in some parts of the city. The News and Eagle translated stories into two languages – Spanish and Marshallese -- to ensure all who live in the community could read a series of stories documenting the unevenly maintained water system and its public safety ramifications. The Anderson, Ind., Herald Bulletin won a Public Service award for a comprehensive report on the methamphetamine scourge in its home county. Judges lauded the newspaper for broadening its view to focus on homes contaminated by poisons associated with meth -- a trend that affects many readers and property owners -- as well as forward-looking editorials that called for a response from the community at large. Among smaller dailies, The Meridian, Miss., Star won a Public Service prize for its aggressive pursuit of a story involving the mysterious draining of a local reservoir. Judges also honored three Magazines of the Year including Grand Traverse Scene, commended for features that capture the life and community in the Traverse City, Mich., region; Corridor magazine in Fairmont, W.Va., for polished packages that give readers a strong sense of place; and Business Times of Edmond, Okla., for appealing to business leaders and everyday consumers and investors. 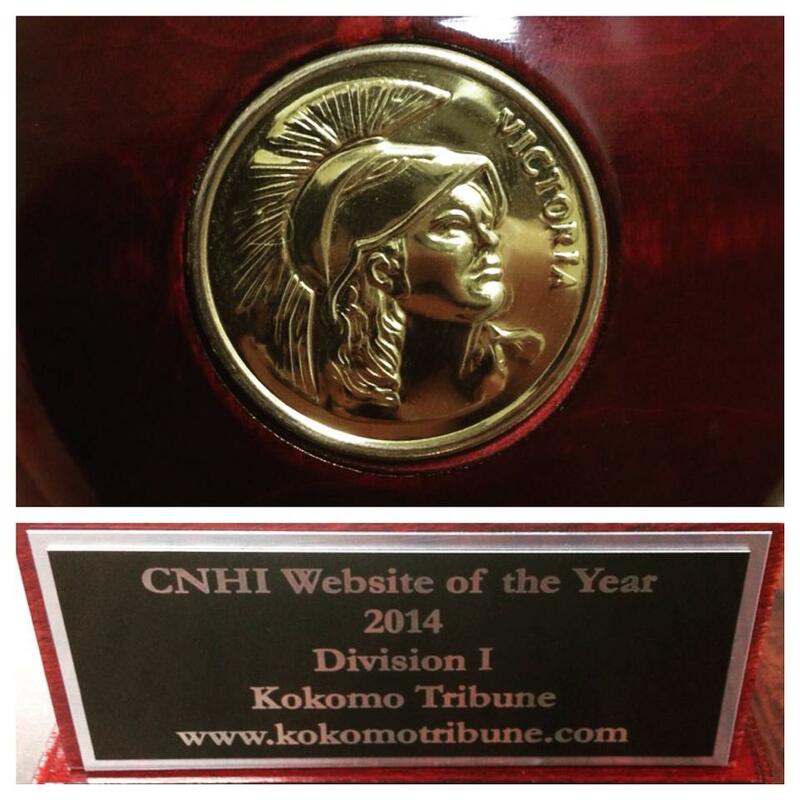 The annual Best of CNHI contest recognizes the individual and collective achievements of the company's journalists. The contest was judged by a panel of six veteran editors. CNHI (Community Newspaper Holdings Inc.), based in Montgomery, Ala., publishes newspapers, websites and specialty publications in more than 130 communities in 23 states. Reporter of the Year: Keith Eddings, The Eagle-Tribune, North Andover, Mass. (large dailies); Matt Koesters, The News & Tribune, Jeffersonville, Ind. (small dailies); Bill Kirk, The Andover, Mass., Townsman (non-dailies). Sports Writer of the Year: Aaron Snyder, Ashland, Ky., Independent (large dailies); Rob Ketcham, Cullman, Ala., Times (small dailies); Charles Curcio, Stanly News and Press, Albemarle, N.C. (non-dailies). Editorial Writer of the Year: Lois Clermont, Plattsburgh, N.Y., Press-Republican (large dailies); Shea Van Hoy, The News & Tribune, Jeffersonville, Ind. (small dailies). Columnist of the Year: Samantha Perry, Bluefield, W.Va., Daily Telegraph (large dailies); Misty Poe, Times West Virginian, Fairmont, W.Va. (small dailies); Tammie Toler, Princeton Times (non-dailies). Photographer of the Year: Paul Bilodeau, The Eagle-Tribune, North Andover, Mass. (large dailies); Mike Springer, Gloucester, Mass., Daily Times (small dailies); Heather Mullinix, Crossville, Tenn., Chronicle (non-dailies). Designer of the Year: Justin Chisham, Anderson, Ind., Design Center (large dailies); Claire Munn, The News & Tribune, Jeffersonville, Ind. (small dailies); Fran Landry, North Andover, Mass., Design Center (non-dailies). CNHI, based in Montgomery, Alabama, is one of the country’s leading publishers of local news and information. It serves more than 130 communities in 23 states with newspapers, niche publications, websites and related digital services. 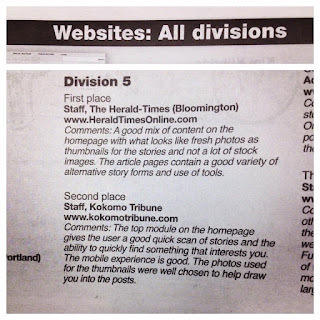 On Dec. 5, 2015 at the 2015 Hoosier State Press Association Foundation Better Newspaper Contest Awards Luncheon and Newsroom Seminar at the Indianapolis Marriott North, Kokomo Tribune won Second Place for Best Online Site/Web Page for Division 5, which comprises daily newspapers with circulations between 14,000 and 34,999. Comments: The top module on the homepage gives the user a good quick scan of stories and the ability to quickly find something that interests you. The mobile experience is good. The photos used for the thumbnails were well chosen to help draw you into the posts. 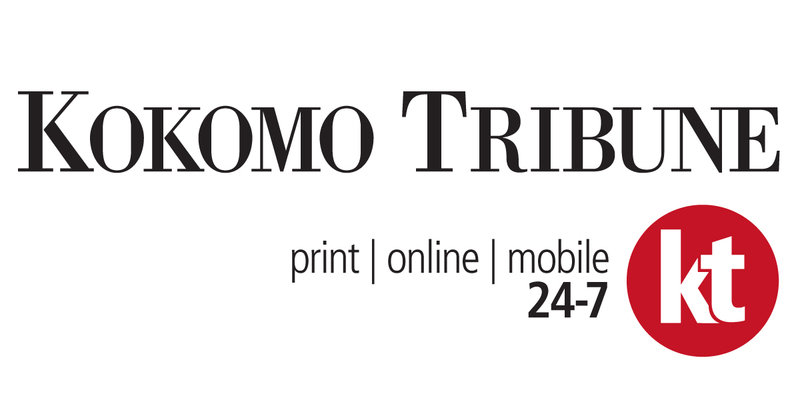 The Kokomo Tribune brought home 15 awards at this year’s Hoosier State Press Association Foundation Better Newspaper Contest. The results were announced at the 49th annual awards luncheon Saturday at the Indianapolis Marriott North. Work submitted to the contest was published between July 1, 2014, and June 30, 2015. 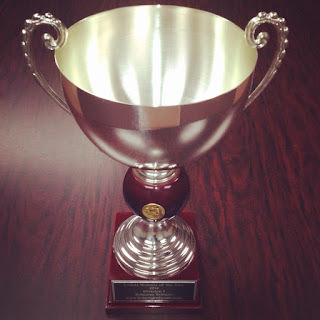 Several individual Tribune staffers were awarded top honors for their work. First place for Best Editorial Cartoonist in the daily category went to Gene Herndon. First place in the Best Editorial Writer category went to Jeff Kovaleski. First place in the Best Use of Graphics category went to Rodney Ogle. Josh Sigler won first place for Best Sports News or Feature Coverage for his story, “Concussions: Scary situations.” “Very informative,” the judges wrote. “Good use of pullouts and online extras. Also very well written on top of all of that.” Sigler also won second place in the Best Sports Feature Photo for photo accompanying this story. “The timely, national issue gives gravitas to this,” wrote the judges. The Tribune’s photography staff was also decorated for their work. Tim Bath won second place in the Best General News Photo category for his photo, “Dad.” “Emotion and excitement was captured best in the frame before the hug,” wrote the judges. 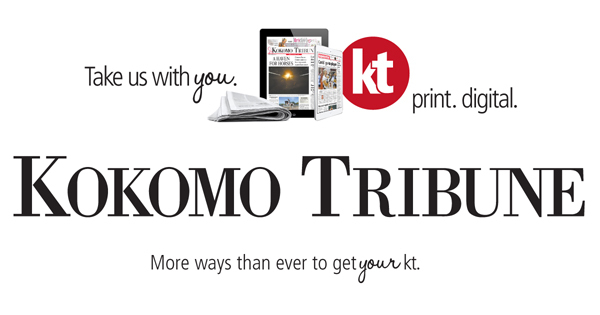 The Kokomo Tribune competes in Division 5, which covers daily newspapers with circulations between 14,000 and 34,999. 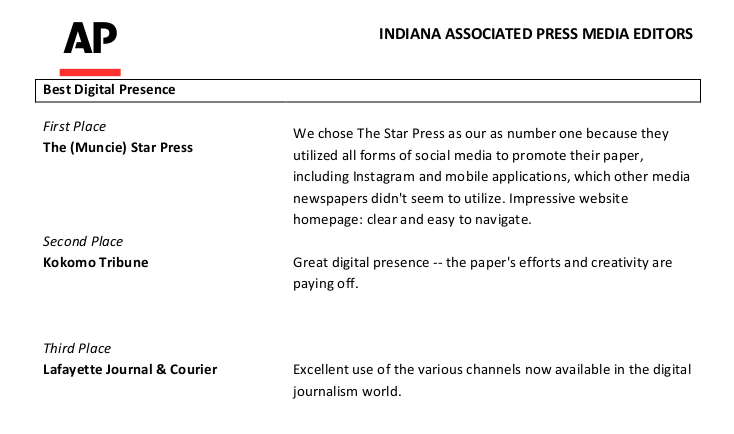 The HSPA, founded in 1933, is a trade association representing 167 daily and weekly paid-circulation newspapers in Indiana, according to its website. HSPA provides legal information, training and other services to its members. On April 15, 2016, the Indiana Associated Press Media Editors held their 2016 IAPME Journalism Contest awards ceremony at the Rathskeller in Indianapolis. 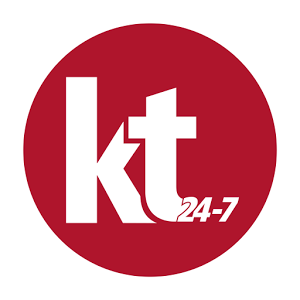 The Kokomo Tribune won several awards, including a staff award for Second Place for Best Digital Presence. Thirty-one daily newspapers submitted 608 entries in the contest, which featured news and sports stories, features, editorials and columns. "Great digital presence -- the paper's efforts and creativity are paying off." Here is the PDF version of the winners list. INDIANAPOLIS (AP) — The Indianapolis Star has won the top reporting award and Thomas J. Russo got top honors for photography in the annual Indiana Associated Press Media Editors contest. Also honored at the IAPME's annual meeting Friday were Adam Kiefer of Indiana University, who was given the Will Counts award for student photojournalism, and AP staffer Brian Slodysko, who was presented the Dale W. Burgess award for service to Indiana media organizations. A Star project detailing the broad impact of the city's more than 6,800 abandoned houses won the Kent Cooper Award, chosen from among top entries in all the contest's news categories. The Tribune-Star in Terre Haute placed second for "City on the Brink," and the Greenfield Daily Reporter took third place for "Absent from Jobs." Russo received the John A. Bushemi award, chosen by a vote of news organizations attending the event after reviewing top photo winners in all categories. 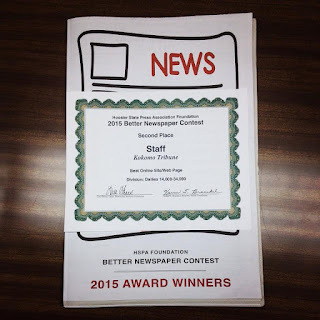 Best Spot News Coverage: 1, The Indianapolis Star, "The RFRA Fix"; 2, The Times of northwest Indiana, "E.C. Council Member Arrested, Charged with Murder"; 3, The Indianapolis Star, "Jared Fogle Search". Best Deadline Sports Story: 1, Steve Hanlon, The Times of northwest Indiana, "Basketbrawl"; 2, Eric Hansen, South Bend Tribune, "Deciphering Life After Golson at ND"; 3, Stephen Holder, The Indianapolis Star, "Riding High: Luck Earns Landmark Victory". Best Feature Writing : 1, Wei Huan-Chen, The Indianapolis Star, "Wei Huan-Chen"; 2, Maureen Gilmer, The Indianapolis Star; 3, Carmen McCollum, The Times of northwest Indiana, "Dialysis: My Story". Best Non-Deadline Sports Story: 1, Tom Noie, South Bend Tribune, "Quite a Confident Kid"; 2, Zak Keefer, The Indianapolis Star, "Game-Changer "; 3, Mike Vorel, South Bend Tribune, "From Rock Bottom to Redemption". Best Column: 1, Virginia Black, South Bend Tribune; 2, Marc Chase, The Times of northwest Indiana, "Homeless Family"; 3, Suzette Hackney, The Indianapolis Star. Best Sports Column: 1, Gregg Doyel, The Indianapolis Star; 2, Greg Jones, The (Fort Wayne) Journal Gazette; 3, Al Lesar, South Bend Tribune. Best Business Writing : 1, Lincoln Wright, South Bend Tribune, "Fantasy Sports Sites Attracting Scrutiny"; 2, Keith Benman, The Times of northwest Indiana, "Electricity Power Struggle"; 3, Erin Blasko, South Bend Tribune, "Blackthorn: Broken Promise?". Best Editorial Writer: 1, Tim Swarens, The Indianapolis Star, "Rights for All"; 2, Alesia Redding, South Bend Tribune; 3, Karen Francisco, The (Fort Wayne) Journal Gazette. Best Headline Writing: 1, Corey McMaken, The (Fort Wayne) Journal Gazette; 2, South Bend Tribune. Best Enterprise Reporting: 1, Carmen McCollum and Marc Chase, The Times of northwest Indiana, "Gary Schools Grapple with Abandoned Buildings, Deficit, Debt"; 2, Kristine Guerra, The Indianapolis Star, "Keith Cooper: I Was Innocent"; 3, Jessie Higgins, Evansville Courier & Press, "Overwhelmed and Grieving". Best Illustration or Graphic: 1, Michael Campbell, The Indianapolis Star, "USS Indianapolis Timeline"; 2, Casey Major, South Bend Tribune, "Writing Up a Wish List"; 3, Michael Campbell, The Indianapolis Star, "Star Wars Movie Character Poll". Best Full Page Design: 1, Casey Major, South Bend Tribune, "Sports Front Pages"; 2, Allison Dale, South Bend Tribune, "Movies Front Pages"; 3, Deborah Hile, The Times of northwest Indiana, "Power Struggle". Best Video: 1, Robert Franklin , South Bend Tribune, "It Can Never Be the Same"; 2, Becky Malewitz, South Bend Tribune, "Special Education Prom"; 3, Robert Franklin, South Bend Tribune, "Remembering the Palm Sunday Tornadoes". Best Multimedia Storytelling: 1, Chad Ryan, The (Fort Wayne) Journal Gazette, "Strangers Pay Veteran Respect"; 2, Chad Ryan and Dave Gong, The (Fort Wayne) Journal Gazette, "Wind, Rain Punch Hard"; 3, Kelly Wilkinson and Shari Rudavsky, The Indianapolis Star, "Welcome to Crazy Town". Best Digital Presence: 1, The Times of northwest Indiana, ; 2, The Indianapolis Star, ; 3, South Bend Tribune. Best Spot News Photo : 1, Santiago Flores, South Bend Tribune, "Reunion"; 2, Michelle Davies, The (Fort Wayne) Journal Gazette, "The Worst Might Be Over"; 3, Robert Scheer, The Indianapolis Star, "A Sister's Agony". Best Sports Photo : 1, Mykal McEldowney, The Indianapolis Star, "Taking a Dive"; 2, John Watkins, The Times of northwest Indiana, "Basketball Pointers"; 3, Robert Franklin, South Bend Tribune, "Stepping Up". Best Feature Photo: 1, Kelly Wilkinson, The Indianapolis Star, "A Civil War"; 2, Michelle Davies, The (Fort Wayne) Journal Gazette, "Delivering Holiday Joy"; 3, Kelly Wilkinson, The Indianapolis Star, "Life's a Blast". Best Photo Story: 1, Robert Franklin, South Bend Tribune, "The Funeral of the Rev. Theodore Hesburgh"; 2, Chad Ryan, The (Fort Wayne) Journal Gazette, "Panthers Win Wild Ride"; 3, Robert Franklin, South Bend Tribune, "Alma". Best Public Service : 1, Virginia Black, South Bend Tribune, "A Bad Choice, a Tough Sentence"; 2, Margaret Fosmoe, South Bend Tribune, "We Need to Do More"; 3, The (Fort Wayne) Journal Gazette, "Health & Fitness Series". Best Investigative Reporting : 1, Brian Eason, The Indianapolis Star, "Abandoned Indy"; 2, Tony Cook and Tim Evans, The Indianapolis Star, "BMV"; 3, Mark Wilson and Thomas B. Langhorne, Evansville Courier & Press, "Miller Plating". Best Spot News Coverage: 1, The (Bloomington) Herald-Times, "Vigils Honor Slain Student"; 2, Douglas Walker and Jordan Kartholl, The (Muncie) Star Press, "Bulldogs Rescued in Raid"; 3, The (Bloomington) Herald-Times, "Hospital Moving East". Best Deadline Sports Story: 1, Pete DiPrimio, The (Fort Wayne) News-Sentinel, "Montoya Picks Off Drivers in 4th Closest Finish Ever"; 2, Blake Sebring, The (Fort Wayne) News-Sentinel, "Komets Triumph Over Snow"; 3, Todd Golden, Terre Haute Tribune Star, "Shock & Awww". Best Feature Writing: 1, Keith Roysdon, The (Muncie) Star Press, "Alive Against All Odds"; 2, Mark Bennett, Terre Haute Tribune-Star; 3, J.C. Lee, The Elkhart Truth. Best Non-Deadline Sports Story: 1, Nathan Baird, Lafayette Journal & Courier, "Near Fall"; 2, Ryan O'Gara, The (Muncie) Star Press, "Left With Everything: Burris' Hollihan Returns"; 3, Pete DiPrimio, The (Fort Wayne) News-Sentinel, "Purdue's Davis a Real Father Figure". Best Column: 1, Jerry Davich, Merrillville Post-Tribune; 2, Marshall King, The Elkhart Truth. Best Sports Column: 1, Reggie Hayes, The (Fort Wayne) News-Sentinel; 2, David Hughes, Terre Haute Tribune Star; 3, Mike Hutton, (Northwest Indiana) Post-Tribune. Best Business Writing: 1, Kurt Christian, The (Bloomington) Herald-Times, "Farewell to Rachael's"; 2, Keith Roysdon, The (Muncie) Star Press, "We Keep Hoping: Living in Muncie's Food Desert"; 3, Bill Strother, The (Bloomington) Herald-Times, "Uncertain Future". Best Editorial Writer: 1, Mark Bennett, Terre Haute Tribune-Star; 2, Merv Hendricks, Terre Haute Tribune-Star; 3, Marshall King, The Elkhart Truth. Best Headline Writing: 1, Deb Sprong, The Elkhart Truth. Best Enterprise Reporting: 1, Tim Vandenack and Jennifer Shephard, The Elkhart Truth, "Down But Not Out: Life in South-Central Elkhart"; 2, The Elkhart Truth, "Forever Changed: 50th Anniversary of Palm Sunday Tornado"; 3, Lauren Slagter, Kokomo Tribune, "Huntington's Disease: Finding a New Future". Best Illustration or Graphic: 1, Rodney Ogle, Kokomo Tribune, "Recycling 101"; 2, Bill Thornbro, The (Bloomington) Herald-Times, "Tracking Critters; Breakdown of Monroe County Salaries". Best Full Page Design: 1, The (Bloomington) Herald-Times; 2, Bill Thornbro, The (Bloomington) Herald-Times, "Tracking Critters, Rocks of Ages, Court: It's Legal"; 3, Alicia Morgan, Terre Haute Tribune-Star. Best Video: 1, Jordan Kartholl, The (Muncie) Star Press, "Art, Music Give Voice to Kassidy"; 2, Nate Chute, Lafayette Journal & Courier, "Central Catholic Assistant Coach Jeff Dienhart"; 3, J.C. Lee, The Elkhart Truth, "Candlelight Vigil". Best Multimedia Storytelling: 1, The Elkhart Truth, "Down But Not Out: Life in South-Central Elkhart"; 2, Lafayette Journal & Courier, "Out of Time"; 3, Kokomo Tribune, "Stories of War". Best Digital Presence: 1, The (Muncie) Star Press, ; 2, Kokomo Tribune, ; 3, Lafayette Journal & Courier. Best Spot News Photo: 1, Jordan Kartholl, The (Muncie) Star Press, "Steeple Struck"; 2, Joseph C. Garza, Terre Haute Tribune-Star, "Water Transport"; 3, Jordan Kartholl, The (Muncie) Star Press, "Ice Rescue". Best Sports Photo: 1, Chris Howell, The (Bloomington) Herald-Times, "Painful Fall"; 2, Jordan Kartholl, The (Muncie) Star Press, "Basketball Smack"; 3, David Snodgress, The (Bloomington) Herald-Times, "Performing Dunk". Best Feature Photo: 1, Jordan Kartholl, The (Muncie) Star Press, "Flag Climber"; 2, Sam Householder, The Elkhart Truth, "Santa-Con"; 3, John Terhune, Lafayette Journal & Courier, "Ready, Set ... Eat!". Best Photo Story: 1, Jordan Kartholl, The (Muncie) Star Press, "Dog Raid/Rescue"; 2, Jordan Kartholl, The (Muncie) Star Press, "Meth Raid"; 3, Chris Howell, The (Bloomington) Herald-Times, "Honor Guard". Best Public Service: 1, Terre Haute Tribune-Star, "City on the Brink"; 2, Seth Slabaugh , The (Muncie) Star Press, "Identity Theft Rocks Ball State". Best Investigative Reporting: 1, Keith Roysdon, The (Muncie) Star Press, "Muncie's Debt: Too Much or Not Enough? "; 2, Steven Porter, Lafayette Journal & Courier, "Soft Target". Best Spot News Coverage: 1, Stu Hirsch and Scott Miley, The (Anderson) Herald Bulletin, "Heroin Sweep"; 2, Franklin Daily Journal, "Grateful "; 3, The (Anderson) Herald Bulletin, "Election Coverage". Best Deadline Sports Story: 1, Franklin Daily Journal, "Champs/How Sweet It Is/Perfect! "; 2, Josh Chapin, Richmond Palladium-Item, "This Is What I Do Now"; 3, George Bremer, Heather Bremer and Rick Teverbaugh, The (Anderson) Herald Bulletin, "Semistate Basketball". Best Feature Writing : 1, Jonathan Streetman, The (Jasper) Herald, "Streetman"; 2, Jason Recker, The (Jasper) Herald; 3, Franklin Daily Journal, "Still Franklin Strong: They Deserve Some Grace ". Best Non-Deadline Sports Story: 1, Franklin Daily Journal, ; 2, Julie McClure and Olivia Covington, The (Columbus) Republic, "Basketball Star Speidel Hurt in Accident"; 3, Joe Jasinski, The (Jasper) Herald, "In All Habitats, Crews' Yields Just Come Natural". Best Column: 1, Jason Recker, The (Jasper) Herald; 2, Amanda Beam, Jeffersonville News and Tribune; 3, Jason Thomas, Jeffersonville News and Tribune. Best Sports Column: 1, Jerry Pattengale, Marion Chronicle-Tribune, "The Fed Ex Cup and Political Swings"; 2, Rick Morwick, Franklin Daily Journal; 3, George Bremer, The (Anderson) Herald Bulletin. Best Business Writing: 1, Rachel Sheeley, Richmond Palladium-Item, "Collecting Old Debts"; 2, Kirk Johannesen, The (Columbus) Republic, "Study Targets Industries Columbus Should Recruit"; 3, Zach Osowski, The (Anderson) Herald Bulletin, "Here Comes the Debt, Mom Business, Fried Magic". Best Editorial Writer: 1, David Penticuff , Marion Chronicle-Tribune; 2, Scott Underwood, The (Anderson) Herald Bulletin; 3, Rich Gotshall, Franklin Daily Journal. Best Headline Writing: 1, Franklin Daily Journal; 2, Franklin Daily Journal; 3, The (Columbus) Republic. Best Enterprise Reporting: 1, Ben Quiggle, Marion Chronicle-Tribune, "TIF "; 2, The (Anderson) Herald Bulletin, "Mounds Lake"; 3, Jeffersonville News and Tribune, "HIV Outbreak". Best Illustration or Graphic: 1, The (Columbus) Republic, "Top Dog"; 2, Anna Perlich, The (Columbus) Republic, "Big Bin Business"; 3, Heather Bremer, The (Anderson) Herald Bulletin, "Dawn of Hoosier Hysteria". Best Full Page Design: 1, Franklin Daily Journal; 2, Heather Bremer, The (Anderson) Herald Bulletin; 3, The (Columbus) Republic. Best Video: 1, Heather Bremer and Staff , The (Anderson) Herald Bulletin, "Top 50 Most Influential People"; 2, Marisa Gartland, Jeffersonville News and Tribune, "Facing Homelessness"; 3, Andy Knight, The (Anderson) Herald Bulletin, "State Fair Band Day". Best Multimedia Storytelling: 1, Heather Bremer and Staff, The (Anderson) Herald Bulletin, "Election Day 2015". Best Digital Presence: 1, Richmond Palladium-Item; 2, Heather Bremer and Staff, The (Anderson) Herald Bulletin; 3, The (Jasper) Herald. Best Spot News Photo: 1, Tyler Stewart, Jeffersonville News and Tribune, "Just Breathe"; 2, Jeff Morehead, Marion Chronicle-Tribune, "Dollar General Fire"; 3, John Cleary, The (Anderson) Herald Bulletin, "Cooling Off". Best Sports Photo: 1, Don Knight, The (Anderson) Herald Bulletin, "Semistate Excitement"; 2, Scott Roberson, Franklin Daily Journal, "Pickoff"; 3, Andrew Laker, The (Columbus) Republic, "North Girls Celebrate State Basketball Championship". Best Feature Photo: 1, Andrew Laker, The (Columbus) Republic, "Squirrel Eating Doughnut"; 2, Tyler Stewart, Jeffersonville News and Tribune, "They Call Me Cowboy"; 3, John Cleary, The (Anderson) Herald Bulletin, "Supreme Showmanship". Best Photo Story: 1, Rachel Mummey, The (Jasper) Herald, "Another Chance"; 2, Tyler Stewart, Jeffersonville News and Tribune, "Bridgepoint Burns"; 3, Jeff Morehead, Marion Chronicle-Tribune, "Dog is My Co-Pilot". Best Public Service: 1, Jeffersonville News and Tribune, "Facing Homelessness"; 2, Marion Chronicle-Tribune, "Poverty"; 3, Millicent Martin Emery, Richmond Palladium-Item, "12 Months of Giving". Best Investigative Reporting: 1, Julie McClure, The (Columbus) Republic, "Walesboro Airport Project"; 2, Rebecca Bibbs, The (Anderson) Herald Bulletin, "Care Behind Bars"; 3, Marion Chronicle-Tribune, "I-69/Ind. 18 Development". Best Spot News Coverage: 1, Noelle Steele and Samm Quinn, Greenfield Daily Reporter, "Boy Killed in Crash"; 2, Daniel Thompson and Caitlin Sievers, Monticello Herald Journal, "Car Jacker Gunned Down by Police Officers in Monon"; 3, Zach Spicer, The (Seymour) Tribune, "Strong Storm Snaps Utility". Best Deadline Sports Story: 1, Chris Schanz, Portland Commercial Review, "Bunt from the Brink"; 2, Greenfield Daily Reporter, "Bitter Ending"; 3, Ray Cooney, Portland Commercial Review, "Grabau Sisters Help Starfires End Nearly Two Decade Drought". Best Feature Writing : 1, Noelle Steele, Greenfield Daily Reporter, "Fighting for Katie"; 2, Ray Cooney, Portland Commercial Review, "Wright Has Bonded with Savannah Jack"; 3, Jessica Williams, Bluffton News-Banner, "My Heart Was Married to Him". Best Non-Deadline Sports Story: 1, Ray Cooney, Portland Commercial Review, "Pettus in Pittsburgh"; 2, Travis David, The Greene County Daily World, "Toon Finding Other Ways to Lead Cardinals"; 3, Jordan Morey, The (Seymour) Tribune, "Into the Woods". Best Column: 1, Mark Miller, Bluffton News-Banner; 2, Mike Marturello, The (Angola) Herald Republican, "The Good Old Days of Wearing Bread Bags"; 3, Dave Schultz, Bluffton News-Banner. Best Sports Column: 1, Terry Schwinghammer, The Greene County Daily World; 2, Ray Cooney, Portland Commercial Review; 3, Travis David, The Greene County Daily World. Best Business Writing : 1, Ray Cooney, Portland Commercial Review, "No Buyer for Bluff Point"; 2, Chay Reigle, Monticello Herald Journal, "Delphi Opera House Ready for Grand October Reopening". Best Editorial Writer: 1, Rich Gotshall, The (Seymour) Tribune; 2, Ray Cooney, Portland Commercial Review; 3, Mike Marturello, The (Angola) Herald Republican, "Our View". Best Headline Writing: 1, Ray Cooney, Portland Commercial Review; 2, Greenfield Daily Reporter; 3, Rich Gotshall, The (Seymour) Tribune. Best Enterprise Reporting: 1, Samm Quinn, Greenfield Daily Reporter, "I'm Just Surviving"; 2, Noelle Steele, Greenfield Daily Reporter, "Letting Priscia Go"; 3, Caitlin VanOverberghe, Greenfield Daily Reporter, "Every Child Deserves a Chance". Best Illustration or Graphic: 1, Greenfield Daily Reporter, "Drawing Conclusions"; 2, Kyle Lewis, Greenfield Daily Reporter, "Children Are Dying"; 3, The (Seymour) Tribune, "A Matter of Life and Death". Best Full Page Design: 1, The (Seymour) Tribune, ; 2, The (Seymour) Tribune, ; 3, Greenfield Daily Reporter, "Boy Killed/Black and White/Storming the Stage". Best Digital Presence: 1, Portland Commercial Review. Best Spot News Photo: 1, Thomas J. Russo, Greenfield Daily Reporter, "Barn Fire"; 2, Chris Schanz, Portland Commercial Review, "House Fire"; 3, Dave Schultz, Bluffton News-Banner, "Perp Walk". Best Sports Photo: 1, Terry Schwinghammer, The Greene County Daily World; 2, Ray Cooney, Portland Commercial Review, "Header on the Horizon"; 3, Thomas J. Russo, Greenfield Daily Reporter, "Handstand Touchdown". Best Feature Photo: 1, Thomas J. Russo, Greenfield Daily Reporter, "Harvest Sunset"; 2, Ray Cooney, Portland Commercial Review, "Hog Wrestling"; 3, Aaron Piper, The (Seymour) Tribune, "Salute". Best Photo Story: 1, Thomas J. Russo, Greenfield Daily Reporter, "Pentecostal Praise"; 2, Zach Spicer, The (Seymour) Tribune, "Lemonade Stand". Best Public Service: 1, The (Seymour) Tribune, "Colors of Hope"; 2, Greenfield Daily Reporter, "Spirit to Survive"; 3, Mike Lamm, The Decatur Daily Democrat, "Deliveries Or Littering?". Best Investigative Reporting: 1, Noelle Steele and Samm Quinn, Greenfield Daily Reporter, "Absent from Jobs". Thirty-one daily newspapers submitted 608 entries in the contest, which featured news and sports stories, features, editorials, columns.